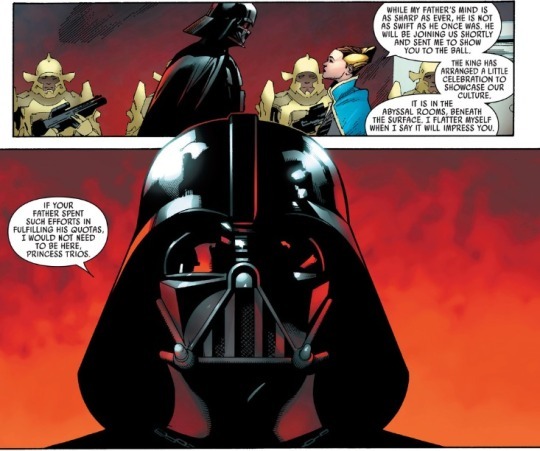 Among the fresh wave of Star Wars comics released under the Marvel Comics banner, there is near universal agreement that Darth Vader is one of the best of the bunch, if not the best. The quality boils down to not just the writing, but to the artwork, as well. It takes considerable care to render Darth Vader’s helmet accurately on a reliable basis, something that almost every panel demands in every issue. The first annual issue of Darth Vader continues this tradition, trading out the great work of Salvador Larroca for the excellent penciling of Leinil Yu, and retaining Kieron Gillen in the role of writer. Perhaps the best element of the Darth Vader series, part of a greater effort by the Disney owned Lucasfilm, is the rehabilitation of Darth Vader. This was not a necessary thing until the advent of the Prequels, which peeled away the mask to the boy and man who would later wear the infamous guise. The innocence of young Anakin Skywalker did little harm to the character of Darth Vader, and regardless of how one feels about the decision to introduce such a young version of Anakin, cast a nice contrast against the dark helmed villain to come. The damage, unfortunately, came with the older Anakin Skywalker, portrayed by Hayden Christensen in Attack of the Clones and Revenge of the Sith. This is not to lay blame on either Mr. Christensen or George Lucas, but the Anakin Skywalker that emerged in these two films became one, fairly or not, that embodied an annoying tendency to complain a bit too much and whose downfall was almost over the top. The dismal cherry atop the Darth Vader creation story sundae was the regrettable “Nooooo!” in Revenge of the Sith, which was then carried over into the blu-ray edition of Return of the Jedi as a point to connect the two climatic moments of Vader’s existence, his creation and his destruction. From this perspective, the Vader which had existed before had been weakened, his fearful reputation undermined. Thankfully, a number of projects since Disney’s acquisition have done a lot to build up the frightful and terrifying nature of the Sith Lord, and at the heart of this effort, the Darth Vader series. 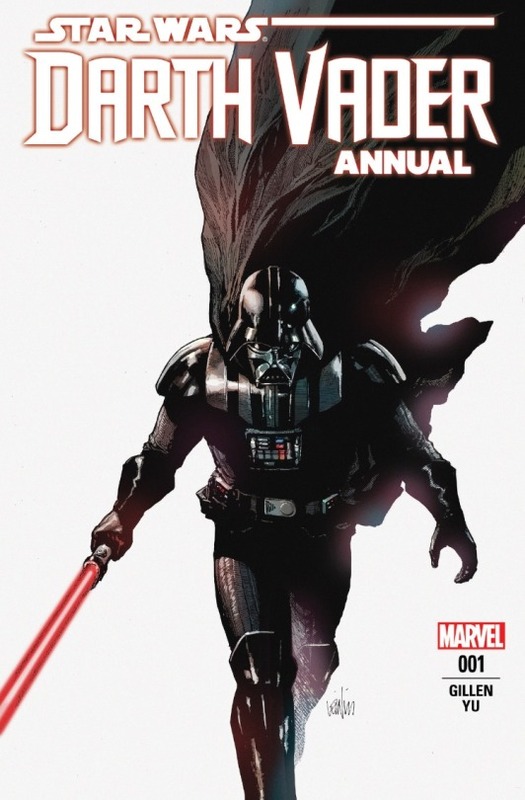 In this capacity, the Darth Vader Annual exists as an incredible exhibit A of how well Marvel is doing at performing this task; combining his martial prowess, his strength with the Force, and downright ruthlessness in accomplishing his tasks, in one tidy package. It all begins on the heavy mining planet of Shu-torun. Not long after the destruction of the First Death Star, Vader is sent to the mining planet to remind them of their service to the Empire and to encourage them to meet the strenuous demands of Imperial industry. It’s hinted that the minerals of Shu-torun are needed for the construction of a new Death Star, but left unsaid. Shu-torun, as we quickly learn is a planet whose leadership is courtly to the point of zealousness, consisting of a fickle and petty nobility ruled by a king with three children. It is the third, the expendable daughter, Princess Trios who is sent to greet Vader upon his arrival. After the pair depart the landing platform, we also see that Vader was accompanied by two of his droids, Triple Zero and BT-1, who disappear off on their own personal mission. The first example of Vader’s temperament occurs when Trios escorts him into a ballroom where, outwardly, a gala is being held in his honor. The nobility sweep across the floor in a waltz, a key part of courtly protocol and one in which Vader is invited to partake by one Shu-torun duke. Vader refuses, unsurprisingly, which the duke takes as an insult and promptly orders Vader to dance. Vader’s own response is to seize the duke with the Force fling him upward and continue walking toward the king’s audience chamber, leaving the ridiculous noble to a hard landing behind him. The audience to this lesson in addressing a Sith have almost no time to absorb it when a mining vehicle spills through the ceiling and assassins pour out to attack Vader. The attack is almost laughably brief with Vader handedly defeating them. We cut away from Vader to find the king and his two other children anxiously watching them with the reveal that the monarch was behind the attempted hit. Also with the monarch are Triple Zero and BT-1, who by now we’ve learned have been sent on an assassination mission of their own. Triple Zero, reflecting our other familiar protocol droid’s unintentional humor, bumbles about attempting to convince the king and assorted royal family to drink from his poisoned drinks. We are treated to repeated failures, and then a cut away to Trios guiding Vader into what turns out to be a trap designed to eliminate the Lord of the Sith, a vast tunnel that begins to fill with molten lava. 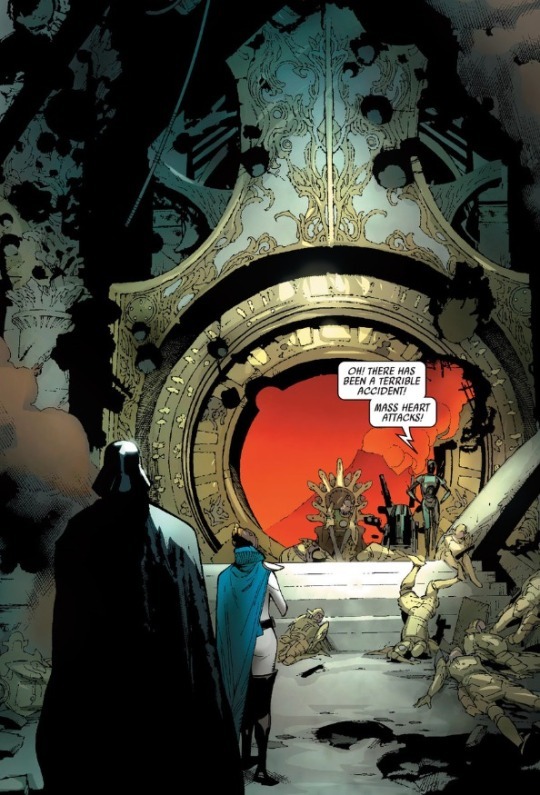 Without hesitation, Vader analyzes his situation and executes a plan of escape which involves slicing a circular piece of the wall to ride on the rising lava to a stairwell otherwise out of reach. It’s the indomitable Lord Vader at his best. The threat of assassins, molten lava, and courtiers, behind him, Vader makes it to the entrance to the throne room. It’s at this point Trios attempts one last time to be the loyal princess and pulls a blaster on Vader. She loses her hand, but gains Vader’s approval for the newly vacant position of ruler of Shu-torun. Behind the closed doors, the pair of lethal droids had fallen back to Plan B, which amounted to BT-1 unleashing his concealed armory of weapons upon the inhabitants of the room. The last royal resistance to the Empire and Vader were rendered heaps of smoking bodies. 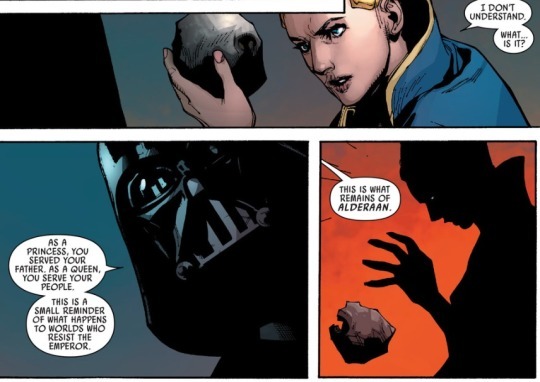 Upon the throne, Vader places Trios and then provides her a gift to serve as a reminder of planets which fail to do the Empire’s bidding – a piece of rubble formerly known as the planet Alderaan. It’s the perfect capstone ending to an issue that just as perfectly embodies Darth Vader. 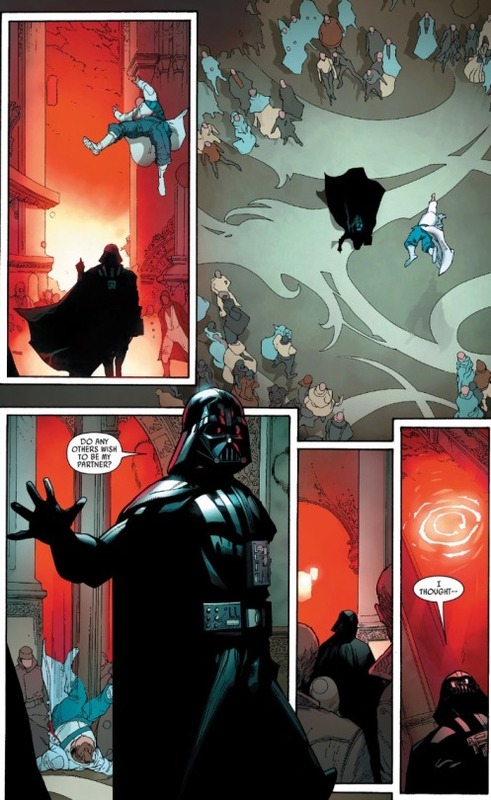 Written by Kieron Gillen with art by Leinil Yu, the Darth Vader Annual is an exquisite example of how to portray the Dark Lord of the Sith, highlighting everything about the character which makes him so incredibly fear inspiring in the face of his enemies. The Annual is a book for any Star Wars fan.